Winter weather got you down? Don’t let the next wintry mix keep you from feeling great—even if the forecast is as frightful as it gets. 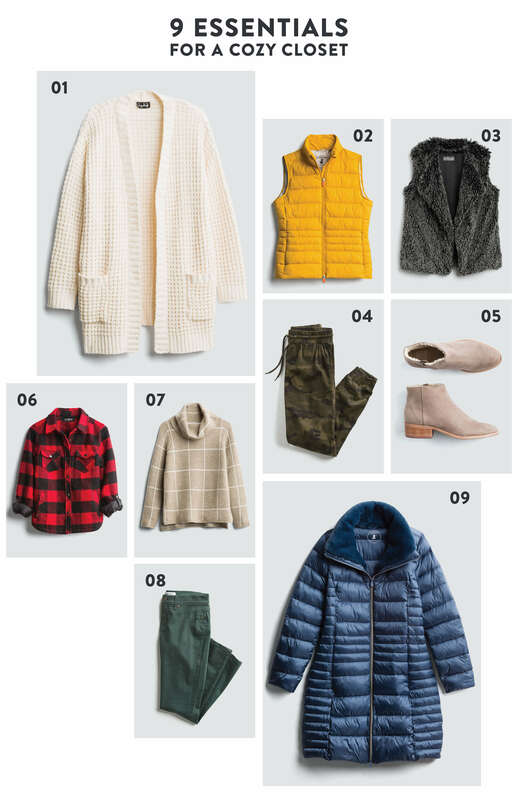 From cable knits to fleece-lined leggings, here are the 9 winter essentials you need to wait out the next snow-pocalypse stylishly. Keep reading to see our favorite cozy winter layering essentials! Keep it casual and cozy with an open cardigan. Layer it over a white button-up for a day at the office or keep it cool with a mockneck sweater underneath. Prep for cold weather with a puffer vest—the best layer to stay toasty all day long. The best part? Layer them under your heaviest peacoat for a chic take on layering. Fur is our friend, but the faux variety of course. This super luxe fabric is our favorite cozy texture this holiday. It’s elevated but casual—you can wear it with jeans or layered over a dress that you transition into winter. Slip into a pair of joggers for a day spent cozying by the fire. Pair these with sneakers for an errand outside or just slip into your plush indoor slippers for a day spent, well, indoors. Ankle booties—our favorite fall staple. These shoes work well in the winter too, especially if they happen to be faux fur lined to boot. Did someone just say cozy? Lumberjack or no lumberjack, plaid is the ultimate cozy essential. Especially when paired with your favorite jeans or leggings once the cold weather really starts to hit. The low-key cousin of the turtleneck. A cowlneck sweater is the easiest way to bundle up while you lounge by the fire or head out to the office. Keep the color coming in bold jeans. Wear your colored denim with your staple knits and blouses—like a striped sweater. What’s warm, soft and seriously cozy all over? A puffer coat! Even if it’s almost in the negatives, a puffer coat is the key staple to wear when it gets cold out. Invest in one for the season and you’ll have it for years to come. Need some new cozy winter essentials? Tell your Stylist before the big chill!